Caldwell Family: Getting Ready for Halloween! 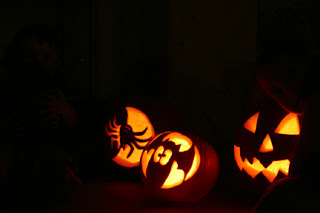 We have had a great night carving pumpkins and thought that we would share our creations with you! 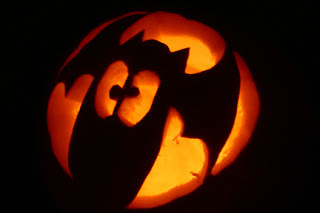 The bat is our favorite! 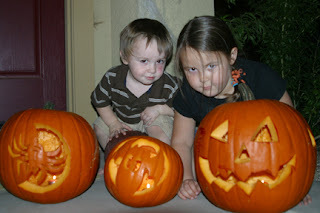 We were able to carve all three without major cuts. However we did have a couple melt downs because the kids were not able to do it ALL by themselves so they went a little bit crazy! Sadie and Sam are looking forward to "Trick or Treating." I don't think that we need anymore candy..... but am looking forward to having a spooky night! PS Sadie drew the face on the Jack-O-Lantern all by herself, and then I cut it out for her, but she is quite the budding artist! Awesome pumpkins! I love their poses and Danielle, once again you have demonstrated what great patience you have! 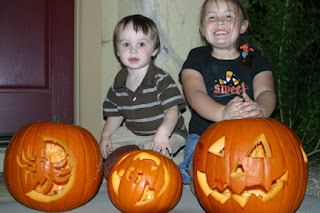 Carving pumpkins is a lot of hard work and to do 3 at one time with 2 kids is quite the task! You never cease to amaze me! thanks for the pictures- I want to see some of you!!! Love you!